Pro-Biolac is a nutritionally complete milk replacer which can be used when mother’s milk production is inadequate. 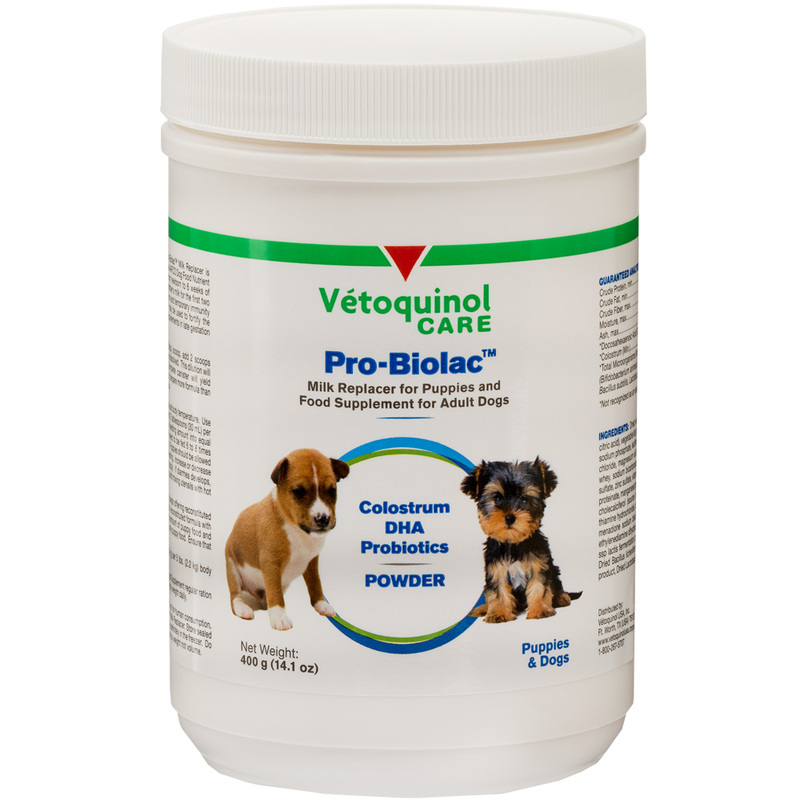 Pro-Biolac can also be used as food for orphan puppies. This supplement may also be used to fortify pregnant mothers to help meet the increased nutritional requirements in late gestation and early lactation. Whenever possible, puppies should receive colostrum (first milk) for the first 2 days, since this supplies antibodies essential to disease resistance in early life. Dried whey protein concentrate, Animal fat (preserved with BHA and citric acid), Vegetable fat (preserved with BHA and citric acid), dried whole egg, canola oil, sodium phosphate, lecithin, calcium carbonate, choline chloride, cod liver oil, potassium chloride, magnesium sulfate, L-arginine, artificial flavor, dried bovine colostrum, dried whey, sodium bicarbonate, alpha-tocopherol (source of vit. E), manganese sulfate, zinc sulfate, vit. A supplement, ferrous sulfate, vit. B12 supplement, zinc proteinate, manganese proteinate, copper proteinate, ascorbic acid (source of vit. C), cholecalciferol (source of vit. D3), niacin supplement, d-calcium panothenate, thiamin hydrochloride, copper sulfate, riboflavin supplement, pyridoxine hydrochloride, menadione sodium bisulfite complex (source of vit. K), biotin, sodium selenite, ethylenediamine dihydroiodide, folic acid, cobalt sulfate, dried fermentation product of (Bifidobacterium lactis, Lactobacillus acidophilus, Bacillus lichiniformis, B. subtilis, and L. lactis).